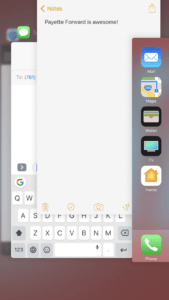 You are at:Home»iPhone»Apps»Gboard Not Working On Your iPhone? Here’s The Real Fix! Gboard Not Working On Your iPhone? Here’s The Real Fix! Gboard is not working on your iPhone and you don’t know what to do. Many iPhone users are installing Gboard, Google’s virtual keyboard app, because it adds the ability to Swype text, send gifs, and other features that the regular iPhone keyboard doesn’t have. 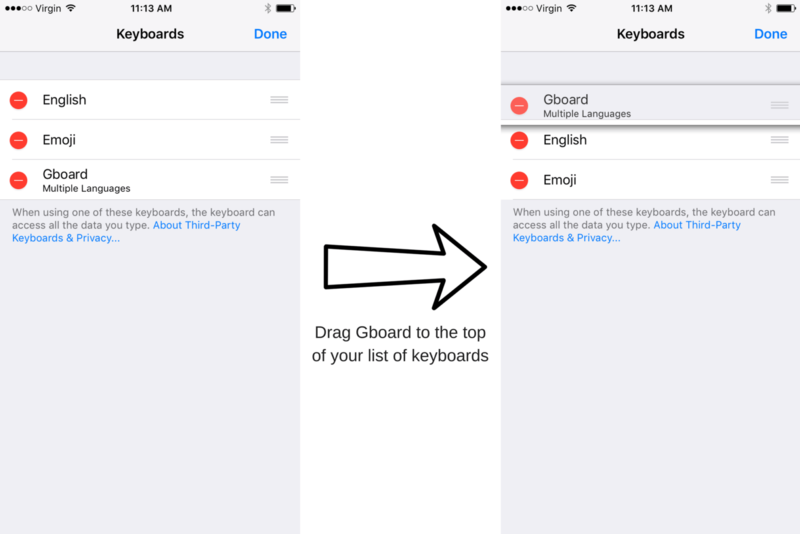 In this article, I’ll explain how to set up Gboard on your iPhone and show you what to do when Gboard won’t work. Sometimes when people think Gboard is not working on their iPhone, they actually just haven’t finished the set up process. 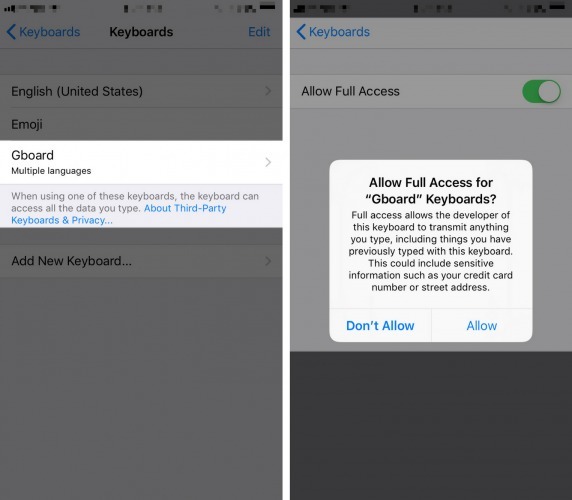 Setting up a new keyboard on your iPhone can be complicated and it requires a lot of steps. To set up Gboard on your iPhone, begin by installing the Gboard app from the App Store. Once you’ve opened App Store, tap the Search tab at the bottom of the screen and enter “Gboard” into the search box. Then, tap Get and Install next to Gboard to install the app on your iPhone. 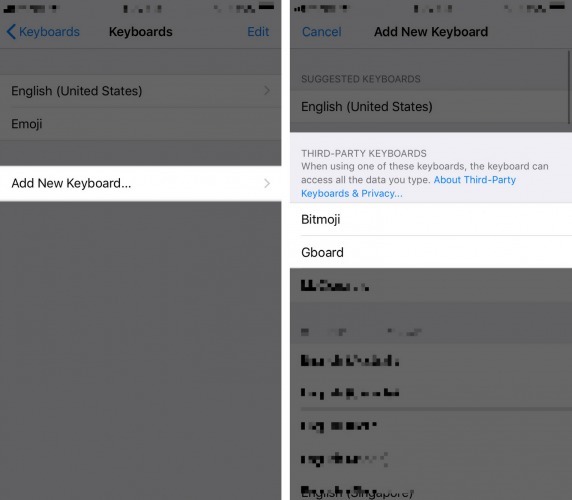 When you tap Add New Keyboard…, you’ll see a list of “Third-Party Keyboards” which you can add to your iPhone. On that list, tap Gboard to add it to your iPhone. Finally, tap Gboard in your list of keyboards and turn on the switch next to Allow Full Access. Then, tap Allow when asked: Allow Full Access for “Gboard” Keyboards? At this point, we’ve successfully installed Gboard and have it set up to appear in any app the uses the keyboard on your iPhone. Can I Make Gboard The Default Keyboard On My iPhone? Yes, you can make Gboard the default keyboard on your iPhone by opening the Settings app and tapping General -> Keyboard -> Keyboards. Next, tap Edit in the upper right-hand corner of the screen, which gives you the option to delete or rearrange your keyboards. To make Gboard your default keyboard, press down on the three horizontal lines on the right of the screen next to Gboard, drag it to the top of your list of keyboards, and tap Done when you’re finished. This change won’t take effect until you close out of your apps, so don’t be surprised if the English iOS keyboard is still the default at first! I Can’t Find Gboard On My iPhone! If you didn’t make it the default keyboard on your iPhone, you can still use Gboard in any app that uses the keyboard. First, open any app that uses the iPhone keyboard (I’ll use the Messages app to demonstrate). Tap the text field where you wish to type, then tap the globe icon in the lower left-hand corner of your iPhone’s display. This will open up the second keyboard in your list of keyboards, which is the Emoji keyboard for most iPhone users. Finally, tap the ABC icon in the bottom left-hand corner of the screen, which will bring you to Gboard. I’ve Done Everything So Far, But Gboard Is Not Working! Now What? If Gboard still isn’t working on your iPhone, there’s probably a software problem that’s preventing Gboard from functioning properly. The first thing I recommend you do is restart your iPhone, which can sometimes fix a minor software glitch. Press and hold the power button until Slide To Power Off appears on the display of your iPhone next to a red power icon. Swipe the red power icon from left to right to turn off your iPhone. Wait about half a minute, then press and hold the power button again to turn your iPhone back on. When Gboard is not working on your iPhone, the problem could be stemming from an app using Gboard, not Gboard itself. 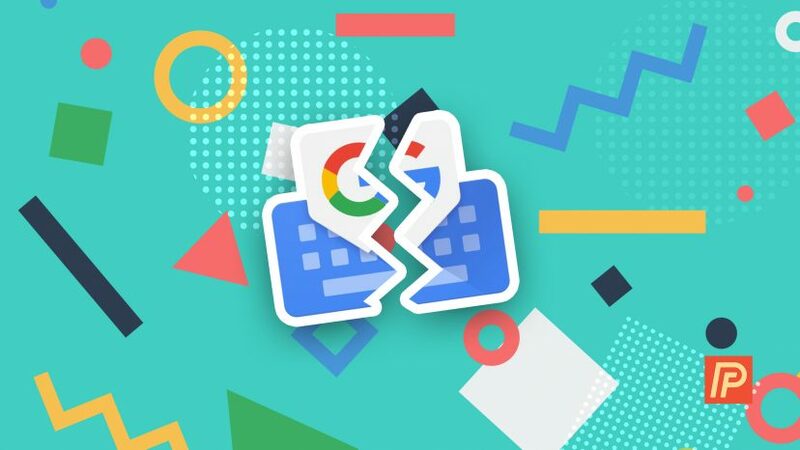 Try closing out of the app or apps you’re trying to use Gboard in, whether it be Messages, Notes, Mail, or any social media apps. All of these apps are prone to the occasional software crash, and closing out of them will give the apps a chance to start fresh. To close out of an app, activate the App Switcher by double-pressing the Home button. You’ll be able to see all of the apps currently open on your iPhone. To close out of an app, swipe it up and off of the screen. You’ll know that app is closed when it no longer appears in the App Switcher. Since Gboard is a relatively new app, it’s prone to minor software bugs which could prevent it from working properly on your iPhone. Google takes a lot of pride in their products, so they are constantly working on and releasing new updates to make Gboard run more smoothly. To check for an update to the Gboard app, open the App Store and tap Updates in the bottom right-hand corner of your iPhone’s display to a list of apps that currently have an update available. If you see an update is available for Gboard, tap the Update button next to it, or tap Update All in the upper right-hand corner of the screen. Keep in mind that if you select to Update All, your apps will still only update one at a time. If you decide you want to update multiple apps at the same time, you can prioritize an app by firmly pressing and holding that app’s icon, which will activate 3D touch. Then, press Prioritize Download to make that app download first. Our final step when Gboard is not working on an iPhone is to uninstall the Gboard app, then reinstall and set up Gboard like new. 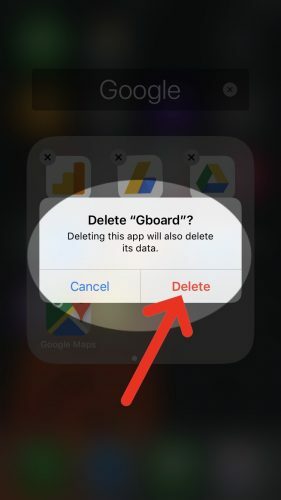 When you delete an app from your iPhone, all of the data that app saved onto your iPhone will be erased, including software files that potentially became corrupted. Now that the Gboard app has been deleted, go back to the App Store, reinstall Gboard, and follow our setup process from the beginning. You’ve successfully set up Gboard on your iPhone and can now use all of its awesome features. I hope this article has helped you understand why Gboard is not working on your iPhone and what you can do if you ever experience this problem again. Thanks for reading, and please leave a comment down below if you have any other questions about iPhones! Previous ArticleVPN On An iPhone: What It Is & Best VPN For iPhone Apps! Next Article Snapchat Not Working On WiFi? Here’s The Real Fix For iPhones & iPads!